This blog is a transcript (not verbose) of the first session of Dr. Darrell Bock’s Credo Course, The Historical Jesus. You can buy the digital audio download for this course here. Welcome to this class on the historical Jesus. It’s my pleasure to be with you today and our goal is to walk you through a course on the historical Jesus, explain a little bit of its background where historical jesus studies came from, the roots of it, how it works, because it doesn’t work in a way that particularly many people in the church are used to. Is it born out of a skepticism? And then to deal with a look at particular key events, particularly through the lens of how a historical Jesus discussion might deal with it. And we start here because there are some people who claim that Jesus’ story is completely a myth, that he has no historical reality what so ever, and you see this popping up occasionally in the public square particularly around Christmas and Easter when we’re reminded of core Christian events such as the birth, and the death, and the resurrection of Jesus. And so this comes up sometimes as the idea that Jesus is a completely created, theological entity with no roots in history what so ever. A question I often like to ask my students is (I do this in entrance exams for doctoral studies occasionally), if I were to ask you to show me that Jesus existed and you could use the Bible, you couldn’t use the Old Testament, the New Testament, anything in between the testaments, nothing Christian, you can’t appeal to the Christian fathers, I’m taking away everything all at once, could you make a case for Jesus’ existence using non-biblical material? And that’s where we’re going to start and that’s where we’re going to begin. The first citation that tends to come up in relationship to Jesus’ existence is a citation from Josephus. 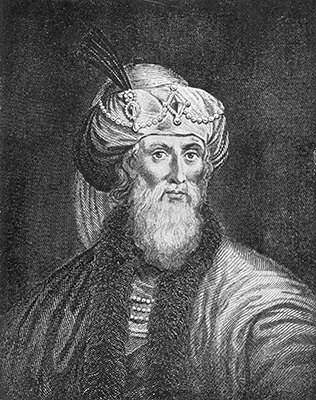 Josephus is a first-century Jewish historian who actually, originally was a general in terms of his function. He fought for Israel against Rome initially in a place called Gamla. If you go to Gamla today it’s remains are still there. It was never rebuilt after the Romans overran it in 67 A.D. The breach in the wall that looks like a kind of cut out cannonball out of the side of the wall is still there. You can march in to the city through that wall, through the breach in the wall. And one of the few remaining evidences of a synagogue in the first-century exists there. It’s an interesting site. It’s located kind of up on a hill with a plateau area all around it and then hills on the edges so militarily it is a wonderful pearch to see what’s going on in a large area of the region. Well Josephus was the general who’s job it was to defend Gomla and he was eventually captured by the Romans. 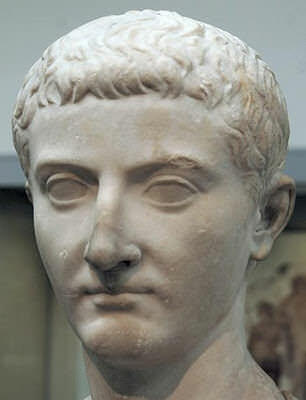 He predicted that Vespasian would become emperor. Kind of viewed as a prophecy, the emperor took it as a prophecy when he did become emperor and so he thought very positively of Josephus; if this guy could predict that I’m going to be come emperor then he must be an OK guy. He took him into his house and Josephus wrote various works in defense of Judaism in the face of Gentile skepticism about Jews. And among those works (he wrote four work) one of them is his life his biography which basically the theme was what a great guy I am. The second work is Against Apion. It’s a defense of Judaism in the face of Gentile skepticism. He wrote a work called The War which was a description of the events leading up to the war with Rome. An attempt to explain that this wasn’t the fault of all Jews but a particular sect of Jews that were responsible for the problem. And then Antiquities which is a history of Israel literally starting from Genesis 1 and going up to his own life. That’s the first hint that this text has been played with. Everyone agrees that what we have today is not exactly all that Josephus wrote because of some of these differences. The idea of “if indeed one should call him a man” suggests that he might not be just human. Josephus was not a Messianic Jew. He was Jewish through and through. He never converted to Jesus. And so, as a result, we know that would be unlikely to write something like that last phrase. We’ll come back to this when we discuss miracles. […]a teacher of people who received the truth with pleasure. And he gained a following both among many Jews and among many of Greek origin. He was the Messiah. The second part of the citation we don’t think goes back to Josephus. Because it’s a confession that Jesus was the Messiah of Israel. […]for he appeared to them on the third day living again just as the divine prophets had spoken of these and countless other wondrous things about him. You can almost hear the Messiah, Handel’s Messiah going off in the background as he cites this portion in fulfillment of the resurrection and a declaration of the resurrection. That doesn’t go back to Josephus. And up until this very day the tribe of Christians named after him has not died out. And that’s the end of the citation. Well what does it tell us? Extracting out those portions, those three portions that are very unlikely to go back to Josephus, we think the citation very much does take the outline of what remains. Namely, that there was a recognition that Jesus was a teacher of wisdom, that he was a doer of unusual deeds that got him attention, that he produced in his wake followers from the Jews and the Gentiles, that Pilot and the leading Jews were responsible for his crucifixion, and finally that Christianity (and those who are called Christians) emerged from his presence in the world as a result. So this is an extra biblical citation from a first-century Jewish figure from whom we know more about the history of Israel in the first-century than almost any other source that we have, and he in the midst of going through this chapter this book 18 is a discussion of various people who disturbed the peace in Judea during the time of Pilot’s rule among others. And Jesus is one of the people who’s mentioned in this section. So that’s one reason we think Jesus existed. But the Jewish testimony to this idea is not the only citation that we have. 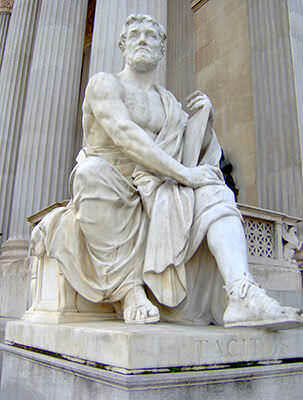 We also have a citation from Tacitus. They [that is the Christians] got their name from Christ who was executed by sentence of the procreator Pontius Pilate in the reign of Tiberius. That checked the pernicious superstition for a short time but it broke out afresh not only in Judea where the plague first arose but in Rome itself where all horrible and shameful things in the world collect and find a home. Not exactly a ringing endorsement of Christianity or that which Jesus was responsible for founding. He calls Christianity a pernicious superstition. Whenever Romans didn’t like a particular religion they called it a superstition. He talks about it being a plague, he talks about Rome being the, how can I say this, the host of all kinds of horrible and shameful things. But in the midst of it all is the note that Christ was executed by the sentence of Pontius Pilate in the reign of Tiberius. This is exactly where the New Testament has Jesus as well. So this is part of a large discussion about Christians and particularly the great fire of Rome which Nero blamed on the Christians. And he goes on in this citation actually to note the amount of sympathy that was created for Christians as a result of Nero’s blaming the great fire of Rome on them and the kind of persecution that he put them under as a result. So that’s the second citation from Tacitus that’s a Roman historian of the early second-century. The third piece of evidence that we have comes from Suetonius. I always liked the way the great pastor W.A. Criswell pronounced the name of this historian. He didn’t say Suetonius he said Sweeeee-tonius. That’s S-w-e-e-e-e-e-t-o-n-i-u-s. He expelled the Jews from Rome on account of the riots in which they were constantly indulging at the instigation of Crestus. Now this is a very indirect allusion. It actually tells us nothing about the life of Jesus if it goes back to him. It simply connects the disturbances in Rome probably between Jews and Christians to the presence of belief in Christ (assuming that Crestus equals Christ) and that’s really all that we get. So there’s not much here. And that’s why whether it actually refers to Christ or not in the end doesn’t matter all that much because it doesn’t tell us all that much other than to point to the origins of the Christian group in Rome going back to Christ. So those are our three citations. Why Accept the Entire Josephus Citation? I want to come back to the Josephus citation because it is an important text and mention one reason why some people do think this is an authentic text as opposed to being a total insertion into the Antiquities. There’s an allusion and a discussion of Jesus being the Christ in the text and later on in the same book, in book 18 (not unit 63 and 64 but unit 200) Josephus again alludes back to the Christ when he discusses the death of James, Jesus’ familial brother (technically half-brother if you’re a member of the Christian faith and believe in the virgin birth). The point is that Josephus alludes to James and then he talks about the brother of the so-called or alleged Christ. Now this is further on down and the argument is that the allusion to the so-called Christ seems to presuppose a previous discussion where the issue of the Christ was raised in one way or another. And people think that in the earlier citation (in the one discussing Jesus) rather than Josephus saying something like he was the Christ (as we have it now) he probably said, alluded, to the fact that Jesus claimed to be the Christ or that people believed that he was the Christ, something like that. And it sets up this later citation and is a later allusion back to this text. So the idea is you wouldn’t have this almost throw away line related to the Messiah unless there was an earlier discussion in the book of the Messianic claims associated with Jesus. So that kind of wraps up our discussion up into a kind of nice bow and suggests why it is that we think Josephus actually said this about Jesus. We have a citation from Josephus a Jewish historian of the early first-century that points to Jesus as a wise teacher, a doer of unusual deeds, executed under Pontius Pilate by pressure that came also from the Jewish leadership and the founder of a movement that became Christianity with Jews and Gentiles participating in it—really a pretty full outline of kind of the most core elements of the story of Jesus. And then we have the citation of Tacitus confirming or corroborating the fact that Jesus died under Pontius Pilate during the time of Tiberius. So here are our core reasons for thinking that Jesus existed. Most scholars, almost without exception, accept the fact that Jesus existed. You can’t explain, it would be hard to explain where the christian movement came from without some historical catalyst for the origins of that movement. The likelihood that he would be a complete fabrication is not very credible at all. So almost all historians of any stripe whatsoever recognize that Jesus existed and that this testimony testifies to his existence. So with that assumption in place we can now begin to raise the question, “Well what about the historical Jesus?” Where did that come from? So let’s talk a little about where this category comes from and why it exists and what makes it important, because it is a very important questions to raise. In fact, some people who are Christians dismiss the entire discussion of historical Jesus studies with the claim—which is actually quite true—that the historical Jesus study, the entire operation, the entire effort, the complete agenda, was born in skepticism. And that’s absolutely correct. The reason you discuss the historical Jesus is because people say “How can we know if the real Jesus did ‘x’ even though the Bible says it?” So it’s born in skepticism. It’s designed to ask the question, “How can we know what’s in the Bible is so?” That’s the question it’s designed to deal with. So it deals with doubts about the accounts. It deals with doubts about the sources. It’s born in a complete skepticism. Now the reason historical Jesus studies is important is because if you have a conversation with someone who doubts the contents of the Bible and you say “The Bible says…” what they will say back to you is “Well that’s the question. The Bible may say it but did it happen?” And in a world of skepticism where the Bible is not viewed as the answer but where the Bible is in fact in question, knowing how to discuss and bring forward rationale and reasons for why you think what the Bible says is true is actually an important conversion to engage in even in the face of skepticism. So this makes moving into this area almost kind of necessary. Particularly if you’re dealing with people who have doubts. Now, a form of apologetics called presuppositionalism will say “No what you do is you continually simply challenge the presuppositions of someone who doubts the scripture and present the Bible as the Word of God being true because it comes from God.” And from one perspective you can see how that very logically follows. If the Bible is the Word of God it has the authority of God who can, you know, adjudicate God? No one can. So at one level you can see how this would work. But the other reality is that when you’re having a discussion with someone for whom revelation may not being a warrant (it may not be a reason to believe because they don’t believe in a God of they don’t believe that there’s such a thing a revelation) what are the things that you’re going to put on the table for people to discuss and to consider in order that they might open themselves up to consider who Jesus is, what he did and what he said? This other approach to apologetics, sometimes called evidentialism, has it’s limits (and we’re going to be talking about that) but it also has value it dealing with someone who’s coming from a more skeptical frame of mind by really trying to give them pause and get them to think about the reasons and rationale that anyone would use (in some cases without some presuppositions) to consider the evidence for who it is that Jesus represents, what it is that Jesus represents, and who it is that he is. Those kinds of things. So the historical Jesus approach is a flawed approach but it’s a necessary approach. It has difficult origins from the standpoint of someone who has faith, but it also has necessary origins because it kind of pushes you to see what you can corroborate about Jesus on standards that anyone might be willing to deal with and accept. And that’s always valuable when you can accomplish that kind of a goal. Are Historical Jesus Studies Inherently Blasphemous? So the apologetics question that rotates around historical Jesus studies is the question of, you know, is there evidence that we can put forward, is there a reason or a set of rationales, that we can put forward for at least taking some aspects of what we see in the Bible about Jesus as being corroborated in some other ways and being reflected on in some other ways? So if we ask the question, perhaps a little more controversially, is the historical Jesus method inherently blasphemous (or an offense to God) in one sense, theologically, we might say, well yes it undercuts the belief in the idea that he speaks, that he exists, that there is word that he has given to people. That certainly is a challenge to the biblical worldview. But on the flip side God is gracious, he tends to meet us where we are and to approach us in light of who we are and sometimes he meets us in the midst of our doubts, and in the midst of doing that the role of evidence in dealing with the historical Jesus is a very very important kind of conversation to have about Jesus. And the fact is that the kind of fact checking (if you want to think of it that way) that the historical Jesus studies has often done has issued in observations and in some cases corrections of our view of Jesus and where it comes from that sometimes are very healthy as people have made the Bible in some cases overreach what it says about Jesus. So this kind of study has a very positive spinoff as part of the process that tries to make sense out of Jesus in his historical context and his historical background. And as we move through and turn later on in the course to discussing particular events and looking where it fits culturally, politically, socially in terms of what Jesus did and why he did certain things those elements and observations of background often have come to us through the kind of study that historical Jesus studies has engendered and has resulted in a positive for us. So Why Study the Historical Jesus? So the short answer to the question, “Why study the historical Jesus?” you study the historical Jesus, in part, to deal with the skepticism that some people have, their inherit distrust of scripture and to begin to get them to think about maybe that scripture actually is telling us something that we need to know about history. And does it matter? It obviously does matter in that kind of a context because it offers us another way to have conversations about Jesus with people who may have questions about Jesus, may have heard skeptical things said about Jesus that kind of thing. And so we need to be aware of that. Do Historical Jesus Studies Have Limitations? Does historical Jesus studies have its limitations? Absolutely. The process of doing history is about probability it’s not about certainty. And because you’re dealing with events that are so displaced and are unrepeatable (this is not like science where you can do an experiment and repeat things), and because you’re dealing with only a handful of sources of what originally existed, you’re always dealing with limitations when you work historically in trying to determine something. And you’re always making judgments about your sources, about the cultural context, about the conflicts that come up and arise as you study those sources that kind of thing. This is not a slam dunk category of discussion. I find myself often reacting to some of the things Christians do popularly as a result of thinking about this for example there’s a very famous apologetics book, very well known, it goes back to Josh McDowell, it’s a book I benefited from when I was growing up in the Lord, it still has a lot of usefulness in it, but the title of it is Evidence That Demands A Verdict. And the “demand” part of that does too much with what historical evidence does. It isn’t evidence that demands a verdict it’s evidence that calls for a verdict. It’s evidence that suggests a verdict. It’s evidence that points in a certain direction. But it doesn’t demand a verdict. There are all kinds of issues and objections that come up that if you answer in a certain kind of way the evidence may not come together in the way in which it’s often presented in the context of Christian apologetics. So we’ve got to recognize the limitations of what it is that historical Jesus studies gives to us. And those limitations are rooted in the historical reconstruction process that anyone goes through writing a history of any period particularly an ancient period where the artifacts or the remains what we have of that history are very piecemeal, we don’t have the recordings like we do today. You’ve got to remember that in the first-century you know there were no computers, there was no printing press, there was no Xerox machine. None of that existed. Everything that was done was either written down on things like papyri or was passed on orally until it was recorded in one form or another. And so our ability to dig back into the past is always piecemeal and has to be reconstructed. So here’s what we’ve said in this first session. We have said that Jesus existed, that Josephus, Tacitus, and perhaps Suetonius give us evidence for Jesus’ existence in sources that have absolutely nothing to do with the Bible: a Jewish historian, a Roman historian, are the sources for those remarks. They place Jesus in the first century. They place Jesus in a time when Pontius Pilat ruled in Israel. They place Jesus in a time when Tiberius was emperor. They place Jesus in a setting which drew Jew and Gentiles to a message that he gave that was both teaching on the one hand and unusual events on the others. That’s the first thing that we said. The second thing that we’ve said is this, that historical Jesus studies is necessary in a world that has skeptical questions about the Bible. Yes, it’s a challenge on scripture. Yes, it doesn’t reflect a theological worldview. Yes, it was born in skepticism. But there still is value in trying to get over the bar that skepticism sometimes sets and to make the case for at least the core elements of what is associated with Jesus. In fact, that’s one of the things we’re going to see is that historical Jesus studies has the potential to actually corroborate some of the core things that we see about Jesus from just the standard kinds of ways that people would argue for any kind of event. That’s a helpful thing to be able to do for someone who has questions about the sourcing and the history of the development of the gospels. And the last thing that we’ve said is that the nature of the historical pursuit itself is a reconstructive exercise that’s rooted in probability not certainty. You’ve got to understand the kind of investigation you’re engaged in and the way in which it works. You’ve got to be aware of what it’s able to give you and what it’s limits are. And we will be talking about this dimension of history as we talk about the historical Jesus all the way through the introductory part of the course as we’re setting up our discussion of how we’re going to look at the events of the life of Jesus. You can read the first quote from Josephus here and the second quote here.